Is there an extension/plug-in for extended grid options? This is something that keeps frustrating me. When I'm using the grid, it will only display the same gridlines at its designated spacing without any indication of "major gridlines." Nearly every other program I use (that features a grid) will display "major gridlines" to help space out the grid better. So for example, I could have every fifth gridline appear darker or thicker, or every tenth, eights, second, whatever. The point is that I can customize the grid to give me a large grid for lining up my larger elements and a small grid for lining up the smaller elements. But by default, I can find no such option within GIMP. So I'm wondering if anyone has made any kind of extension or plug-in or something so that I can enable this feature. 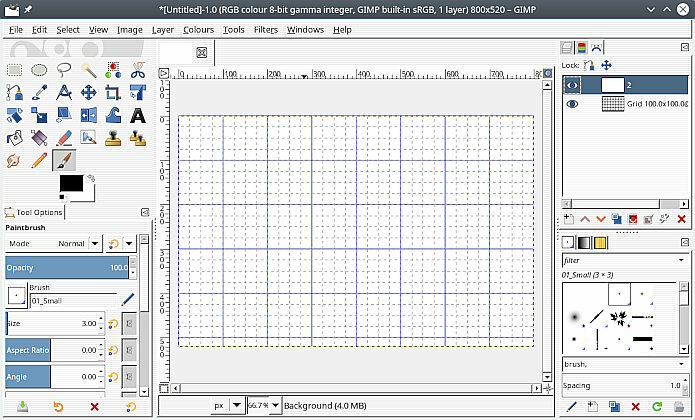 Fundamentally it shouldn't be hard to create one; all the grid functionality already exists in GIMP so it would just need to duplicate it to draw a second grid on the screen. And I can't be the only one who has wanted this. Sure I can add guides, but then the guides will start to encumber the screen; I already use guides at certain key moments to mark boundaries on my image, and unless I could make those guides visually distinct from the ones I want to use as major gridlines I am going to get them confused with each other. (04-13-2019, 12:34 PM)Marscaleb Wrote: When I'm using the grid, it will only display the same gridlines at its designated spacing without any indication of "major gridlines." But there is an easy workaround. Create a transparent layer as the top layer of your layer stack. For example, if your gridlines are set a 100px intervals, create this second grid at 500px intervals and set the colour to red. Remember to switch off visibility before exporting, etc. I know what you mean, but AFAIK nothing like that as a Gimp script. One way might be combine the regular Gimp grid, with ofnuts grid of paths. At least that would be saved on an image basis for future edits. Would look like this depending on how you set the Gimp grid up 25 gimp + 100 path px spacing. Current time: 04-24-2019, 07:56 PM Powered By MyBB, © 2002-2019 MyBB Group.